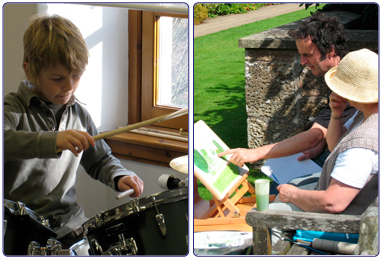 The Arts Development Section develops a variety of activities and projects to make the arts more accessible to the local community. We do this through providing everything from courses, projects, workshops and master classes as well as one-off activities and events, such as theme days, summer schools, concerts and festivals including the 'Young at Heart Festival' every March and the annual 'Summer Arts are ACE' programme. 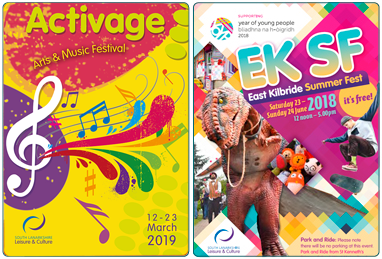 Our wide ranging programme of arts courses and classes is designed to accommodate all needs, ages and abilities and runs in four terms commencing in August, October, January and April each year (three terms at East Kilbride Arts Centre). The Arts Development Team regularly work with national arts companies to provide outreach programmes to support the events and performances within the venues. Further information is available in our arts development brochure and in the ACE children's activities programmes. For a look at some of our Arts Development Projects why not watch our video. We work with local organisations and groups on community-based projects providing advice and support for groups with things such as training, constituting a voluntary arts group, how to access funding and how to develop projects. The Arts Development team has a great success rate in attracting external funding and is currently working with (or has recently worked with) Heritage Lottery Fund, Creative Scotland, The Youth Music Initiative, and The Princes Foundation for Children and the Arts.